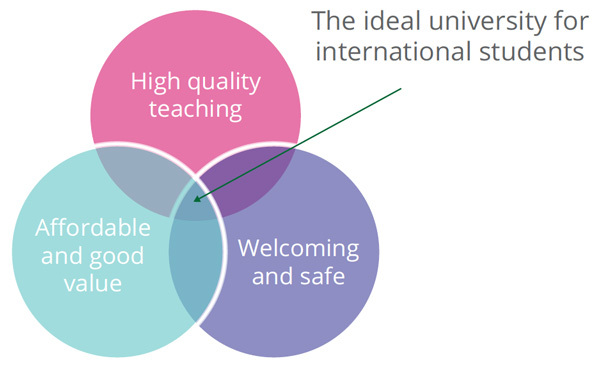 A new global survey of prospective international higher education students finds that universities can boost their attractiveness by highlighting teaching quality and safe and welcoming campus and community. Conducted over January and February 2017 by Hobsons, the fifth annual International Student Survey drew more than 62,000 responses this year from foreign students who intend to study abroad at one of 65 participating universities around the world. “When it comes to choosing a destination our analysis shows perceptions are crucial,” said an accompanying statement from Hobsons. Drilling down into those perceptions a bit, nearly a third of responding students (31%) said that “the degree to which a place feels welcoming” was the most important factor in their choice of a study destination. Among respondents, Australia was seen as the most welcoming country, followed by Canada, the US, the UK, and Germany (see the chart below for more detail). In a parallel finding, Australia was also viewed as the safest country, followed again by Canada, the UK, the US, and Germany. Over its five years, the Hobsons survey has consistently found that the decision path for prospective students starts with the subject or field of study. From there, students choose the country in which they intend to study, and, last but not least, they select an institution. And when it comes to choice of institution, this year’s survey found that students place the greatest weight on teaching quality. Among 11 possible decision factors, nearly a third of respondents (31.6%) said that high quality teaching was the most important factor in their choice of institution. “These findings show us that there is much that universities can do to appeal to international students by demonstrating the strength of their offer in terms other than rankings,” said Hobsons EMEA Managing Director Jeremy Cooper. Indeed, nearly eight in ten (79%) indicated that they would choose a university with excellent teaching quality over an institution highly placed in the rankings. This finding confronts a conventional understanding among many recruiters as to the significance of rankings, especially for some key sending markets. As such, it suggests that lesser-known institutions can overcome a poor spot on a ranking table by clearly establishing the quality of their teaching in the minds of prospective students. More broadly, the survey responses this year echo other recent research that reflects an evolving and more nuanced understanding of university rankings among prospective students. Last year, for example, a QS survey highlighted the importance of peer reviews in student decision making, but also found that students are often keen to drill down past institutional rankings to look for more indicators of programme quality. Coming back to the Hobsons survey, respondents gave the US the nod as the destination with the highest quality of education, followed by the UK, Australia, Canada, and Germany. In fact, the overall impression that one has in looking at student perceptions of key study destinations is that the US remains a top choice for many prospective students, and that concerns over how welcoming or safe it may be are generally tempered by favourable perceptions as to the quality and “value for money” of US education. In an interesting extension of the main survey, Hobsons ran a supplemental poll in March 2017, looking just at students who intended to study in the US. This additional survey attempted to measure the impact of the Trump administration’s travel ban on visitors from six Muslim-majority countries. While none of the 1,030 students who responded to the supplemental survey were from the affected countries, a significant proportion (36%) nevertheless said that the proposed travel ban would influence their decision to study in the US. The main International Student Survey also looked at the other major political story that is shaking the international recruitment landscape this year: the Brexit vote. Shortly after the UK voted to leave the European Union last year, a separate Hobsons poll found that 36% of prospective international students said they would be less likely to study in the UK because of Brexit. In contrast, when surveyed in January and February this year, only 13% of prospective students said that the UK’s pending exit from the EU made them lesss interested in studying in Britain. For the moment, any such survey results are a valuable contribution in tracking the relative attractiveness of major study destinations, particularly in response to significant political events or other environmental factors that bear on how welcoming or safe a destination is perceived to be. One interpretation of the most recent Hobsons finding regarding the students’ view of Brexit is that negative perceptions of a given destination can (and do) moderate over time. This entry was posted in Africa, Asia, Australia/Oceania, Higher Education, Middle East, Most Popular, North America, Regions, Research, South & Central America and tagged Most Popular, . Quality articles or reviews is crucial to invite the visitors to go to see the website, that’s what this site is providing.